When turning a house into a home, it’s hugely important to think about things that are both necessary and add a bit of nice decoration. If you’ve already got the main components in your home, such as a couch, bed, TV, kitchen table, etc., then now’s a great time to include some flair and really make your living space your own. 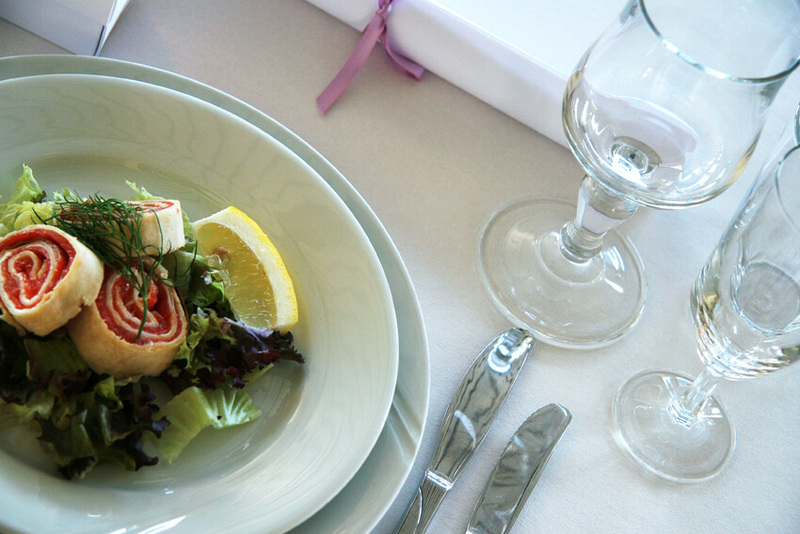 After all, if you want to host a great party, then make sure your place is looking incredible for your guests. IKEA is all well and good, as the items are easy (more or less) to assemble, not hugely expensive, and a breeze to transport from the warehouse to your home. However, the one thing these items do lack is a bit of personality. 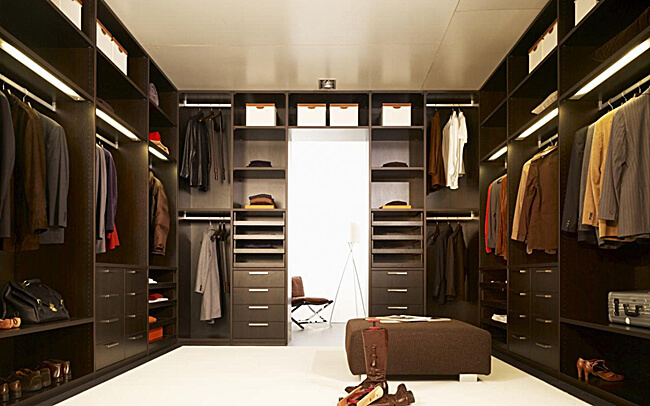 Even if your wardrobe looks great, you just know that thousands of other men have exactly the same thing in their own bedroom, so where’s the fun and individuality of that? While we’re not saying that everything in your abode has to be vintage and retro, just adding a few small pieces here and there makes a big difference. 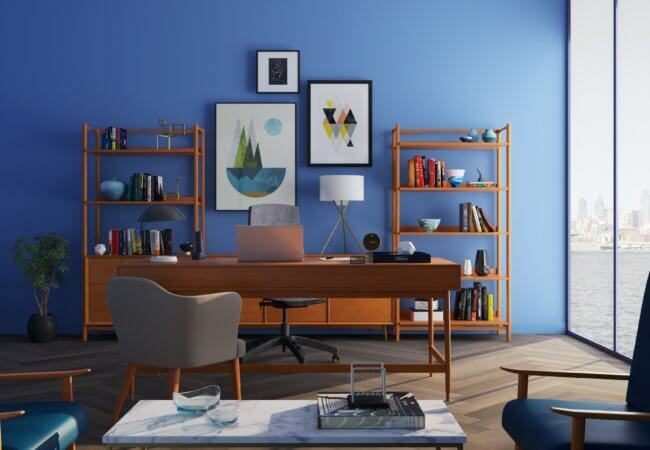 A coffee table from the 1950s, a lamp from the 90s, or even some cutlery and plates from the 80s are all nice touches that show you take a bit more effort to care about your home than the average person. 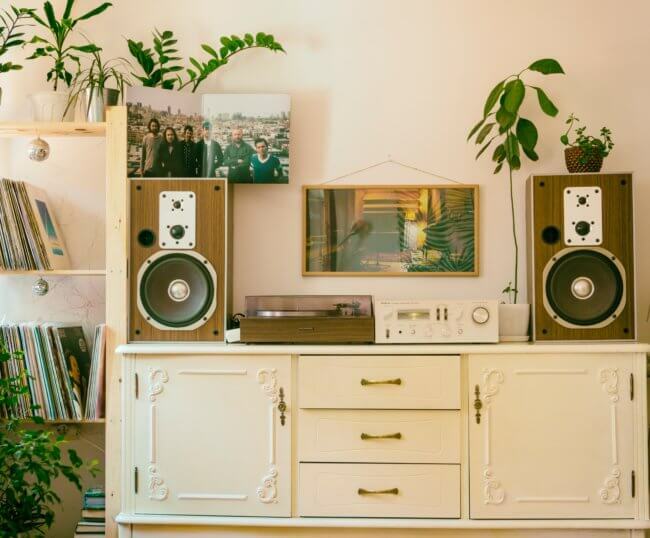 You can find all these items in flea markets and thrift shops, and while some can be a bit tricky to transport, it’s all part of the fun and you can enjoy the reward once it sits proudly in your home. Vintage furniture looks to the past, but smart speakers are all about the future. These handy little voice-controlled gadgets can do everything from controlling the lighting and heating to playing music and reading the news. The great thing about smart speakers, particularly the market leaders in Google Home or Amazon Echo, is that they can be tailored to fit your life. If all you want is something that can play music and answer a few burning questions, then you got it. Plus, they’re cool-looking things and new functions can even be installed if you want to search for the best Alexa skills. In a similar way to the furniture point from before, it’s great to find artwork which not many other people have. Van Gogh and Picasso prints are amazing, of course, but it’s a beautiful thing to support new and upcoming artists who are trying to find their feet. Society6 has some cool wall art from talented yet not well-known painters and photographers. Get some art that really speaks to you, rather than picking up something just because it’s from a big name. Seriously, who doesn’t love plants? They look awesome, provide us with oxygen, and help purify the air in rooms. Best of all, they are far easier living things to take care of than a pet! A bit of water and sunlight is all they require, and you’ve added a functional yet good-looking item into your home. The cactus, lily-of-the-valley, bamboo, and snake plants are often considered to be some of the best plants for apartments, as they are simple to take care of, cheap, and don’t take up much space. 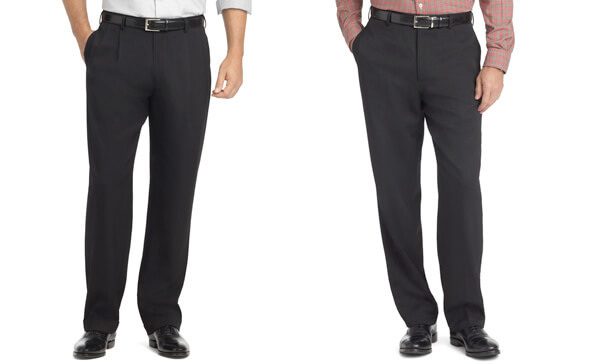 In this article I will talk about difference between pleated and flat front (non pleated) pants. So, if you are in the store shopping for a pair of pants you should know if pleated one will suit you more or if your best option are flat front pants. What’s the difference you will ask! Well it depends on your body type, but we will get into this a bit later. Trousers is a name for a type of tailored pants. They are meant to keep the eyes focused on the wearer’s face without attracting attention to the bottom half of the body. A good pair of trousers creates a sleek profile whether a gentleman is in motion or standing still. Trousers can be casual as well as formal, as they allow men to carry all of the necessities like a phone, wallet, and sets of keys. They have pockets that are of a proper size and the shape does not cause pants to bulge outwards. If you put items in the pockets and notice bulging at the sides, then your trousers may not be ideal. You can even get the pockets adjusted to ensure that every item you need fits. Trousers can be tailored and custom-fitted to your frame and build to the fit is perfect. They should follow the line of the natural shape of your body, being wide at the waist and tapering down to the ankles with no fabric hanging down or swaying. They shouldn’t bunch up around the thighs, as this means they are too tight. Traditionally most trousers were pleated. Today, most pants are flat front. Pleats are considered old-fashioned. Flat front trousers were very popular in the middle of the 20th century, but in the 80’s with its baggy style, pleated pants had a revival. Later it all changed for the more lean, slim looking silhouette and flat front pants came back. It seems that flat front pants come back and go out of fashion, but pleated pants are always present making them more traditional. Tip: Over at Nordstrom they have a great selection of pleated pants! Pleats are creases on the front of the pants, with two of them on both sides. The material is folded and sewed before it is attached to waistband. In flat front pants material lies flat. Pleated pants are worn on the waist, just above your hip bone. This also means that pleated pants have a higher rise. Flat front pants are worn bit lower, on your hips, making them slim looking and better fitting. Since pleated pants have higher rise this makes them more generous in the middle. As you might have guessed pleated pants are better suited for larger men. If you have large back and large bottom you should definitely choose pleated pants. They will give you more freedom of movement and you will feel more comfortable. Wear them on your waist since if you wear them on your hips, your thighs will look huge. 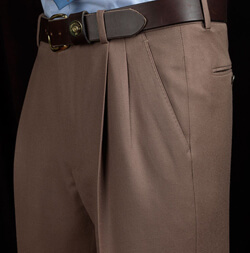 Another detail that should be added to pleated pants is cuffs. If you opt for pleated pants you should add cuffs, because this will complete the classic look of your pants, and it will add weight to your pants making fabric drape naturally. Slimmer men can wear pleated pants only in a suit combination, never alone by themselves since if worn alone they will make extra room around middle section and this will look sloppy. These pants are great for slimmer man. They will make your silhouette more smooth and straight. They should be worn on hips, but they have to fit you perfectly. Also you should leave your pants cuff free, since they do not need extra weight at the bottom. 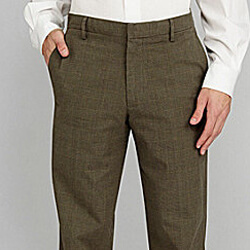 Slimmer men can wear cuffs on their pants only if the pants are from heavier fabric. 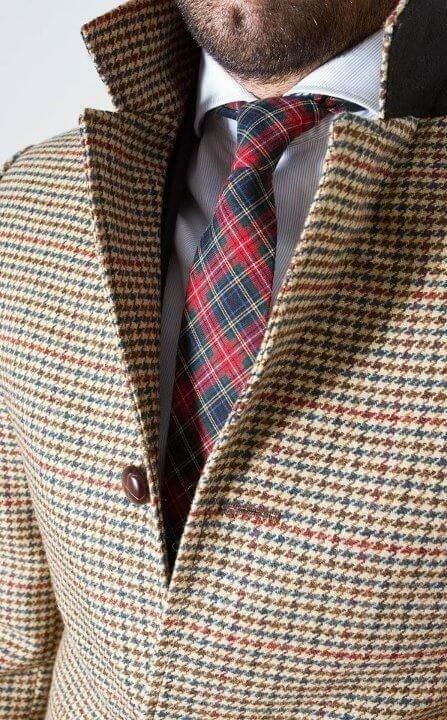 Tweed or such, which is worn in winter cold days. In this way the pants will drape better. If you are a larger modern man you should avoid flat front since it will be too tight for you and they will feel uncomfortable. Flat front pants will also emphasize your belly. If you are somewhere in the middle, neither big, neither slim, you should try both options and see how they feel. Sit down in them, walk around, stand up and be sure they are comfortable in every situation. Try them out with pairing suit jacket and see how it looks, but your comfort must be your priority . If you think you need some alternations to the pants, ask for them. Tailored fit is definitely worth the money. At Modern Gentleman Magazine we take great enjoyment in items that are well made and of high quality. We appreciate the passion exhibited by the men and women behind these types of products. There is often a direct relationship between high-quality products that have been produced for a long time, and a work force that is passionate and proud about what they design and produce. The “Spotlight On” series will highlight these brands, and the products they make. The items covered as part of this series will be a great addition to the life of the modern gentleman. We start the series looking at a brand that has been in operation since 1894, and produces clothing and outerwear that has stood the test of time, Barbour of England. Originally founded by John Barber in 1894 in South Shields, England, “J. Barbour and Sons” began as an importer of oil-cloth (a fabric traditionally coated with boiled linseed oil to make it waterproof). Under John’s grandson Duncan (an avid motorcyclist), the company transitioned to producing waterproof outerwear including motorcycle jackets. 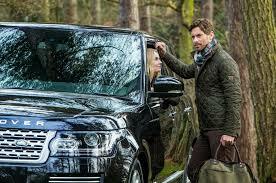 In the time since, Barbour has become famous around the world for producing high-quality outdoor clothing. 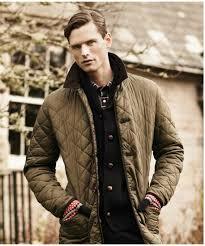 Barbour has since branched out from simple outerwear to a full clothing line, including footwear. After a temporary relocation to Wimbledon in 1916, Barbour opened their first clothing manufacturing plant (the Simonside Factory) in 1981. 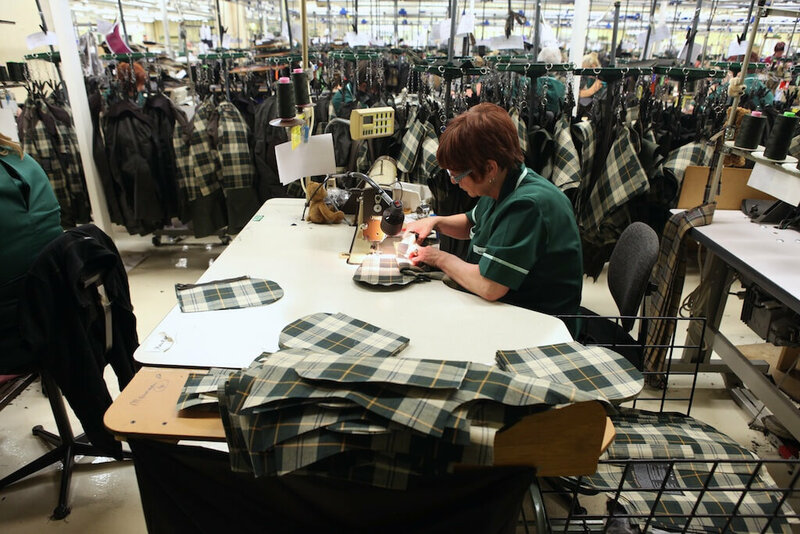 Barbour continues to produce items, most notably their classic waxed jackets, at the Simonside factory today. 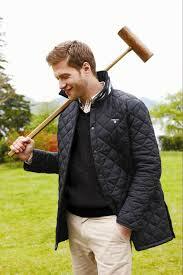 Barbour has received three Royal Warrants from Queen Elizabeth II, the Duke of Edinburgh, and the Prince of Wales. The three warrants are proudly displayed as part of the labels on Barbour’s classic jackets today. Barbour jackets, with their unique look and style, have been worn by many important figures around the world. The visibility Barbour has enjoyed in the media continues to add to Barbour’s popularity worldwide. Most recently, Daniel Craig wore one of Barbour’s more contemporary jackets in the James Bond film Skyfall (tip: read the article on how to dress like you starred in SkyFall over at Esquire, which brought the brand back into the spotlight in the meanswear community. 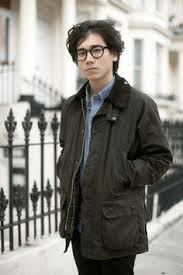 Although Barbour does produce a full line of clothing, the focus of this article is to spotlight the outerwear collection, which has made Barbour a household name around the world. Barbour’s classic waxed jackets typically include a soft corduroy collar that can be turned up to provide the wearer protection from the elements. They include chest level hand warmers that are made of soft moleskin, which is luxurious to the touch. The jackets are typically lined in one of Barbour’s class tartan plaids. Beaufort Waxed Jacket: One of Barbour’s most iconic waxed jackets, the Beaufort was originally created in 1983. The Beaufort was inspired by French shooting jackets, and contains a useful rear full-width lined game pocket. It’s literally where the hunter would store the game he killed, so he didn’t have to carry it in his hands. Bedale Waxed Jacket: Styled very similarly to the Beaufort, the Bedale is a shorter length jacket and was originally introduced for horseback riding. The Bedale has a split vent rear that provides the wearer with additional room and comfort when on horseback. 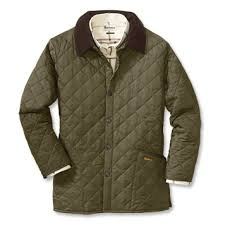 Liddesdale Quilted Jacket: Probably the most iconic of Barbour’s quilted jackets, the Liddesdale is cut generously to fit over layered clothing including knitwear. Barbour’s quilted jackets offer lightweight protection from the elements, and a slimmer silhouette. International Original Waxed Jacket: Barbour’s iconic motorcycle jacket, originally made in 1936. Constructed of heavyweight 8oz. waxed cotton, to protect riders from the elements and the roadway itself. Interesting to note, most of Barbour’s International line of jackets contains one slanted chest pocket, designed to provide a rider easy to access while on his bike. 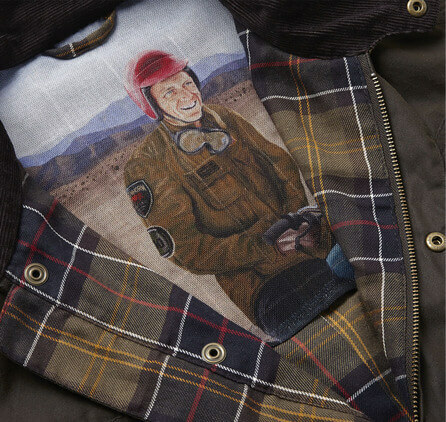 Wax 9665 Jacket: A medium weight wax jacket inspired by the legendary American racer and actor, Steve McQueen. The jacket contains a really unique image of McQueen himself within. To remain relevant today, Barbour has done a fantastic job of offering many of their traditional, iconic jackets in a slimmer silhouette, which is often preferred by the younger generation. 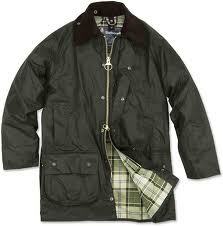 For example, Barbour produces the Ashby, which is a slimmed down version of their Classic Bedale jacket. Another reason Barbour continues to expand their audience is due to their many successful collaborations with other brands from around the world. Barbour has collaborated to create special products for brands ranging from Land Rover and Adidas to smaller ones like Pantone and White Mountaineering. As mentioned earlier, Daniel Craig wore a Barbour jacket in the movie Skyfall, that happened to be a collaboration with Japanese designer Tokihito Yoshida. The Ashby was designed to be stylish and practical for winter as well as any other season. It has a tightly tailored design, more so than the Bedale and the Beaufort, yet it allows room for all of the layers needed to stay warm. The front has hardy fastenings and a throat strap to keep everything secure no matter what activity you are engaged in. You can get it in several colors, increasing the amount of options you have to pair this luxurious jacket with. It is compatible with Barbour zip-in liners, so you can have even more insulation than you originally get with this brand. There are two angled pockets for warming your hands as well as two additional pockets to store essentials. The Ashby can be used on a daily basis, making it one of the most versatile and well-designed in the Barbour range. This Barbour jacket was made to be lightweight and allow for lots of movement. It is shorter than other jackets and has a more relaxed fit as well as an inner “drip-strip” of Nylon that resists moisture that may seep into the jacket. You can zip liners into the jacket for added insulation, keeping you warm in freezing cold weather. Every part of a classic Barbour jacket is included in the Bedale. It has a two-way zipper as well as storm protection in the front of it. The pockets are large and lined with moleskin to keep the hands warm and fit a myriad of items you may need. The Bedale also has a corduroy collar with studs. This look is so classic and popular that is has even inspired a version for women to be designed – the Beadnell. This jacket is for a slimmer frame, allowing women to have the same protection and versatility as men. The Beaufort is a classic when it comes to waxed jackets. 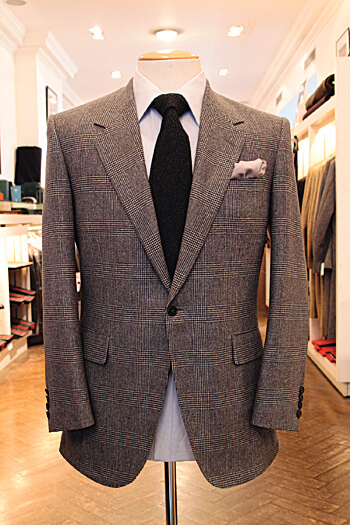 The look is creates is timeless, and the jacket itself is versatile. You can wear it outdoors for protection the elements as well as to add some style to your city look. The fit is relaxed enough to be thrown over a suit while on the go, and you can wear it throughout the year. The lining features the Barbour tartan print and you have the option of inserting a quilted liner if you are ever in need of extra insulation. It is functional as well as luxurious, with soft fabric and a corduroy collar. The front uses a two-way zipper and Velcro to fasten it securely in the event of heavy winds. There are two moleskin-lined pockets, so you can keep all of your valuables close to you while keeping your hands warm. The Ashby is a winter jacket with a more tailored fit than the Beaufort and the Bedale. It still has the classic lined pocket of the brand’s waxed outerwear but has added layers for protection from the cold. The matte finish of the Ashby lends itself to a more rugged, outdoors look, while the Bedale does not have the option of a matte finish. It does, however, have the classic Tartan trim on the inside as an homage to the Beaufort. All Barbour jackets are versatile, as the Bedale was originally designed for riding horses. However, you only get one set of moleskin-lined pockets with this jacket, while the Ashby offers pockets specifically for hand warming. The Ashby has a lot of innovations that could make it become popular very fast for gentlemen that appreciate the quality and signature look of the brand. 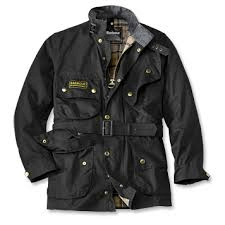 As many makers of high quality goods do, Barbour offers an in-house service to repair or re-wax jackets. There are some wonderful videos that are not hard to find online that show the process a used or damaged jacket goes through to be repaired. Taking this into account, along with the overall quality that the jackets are constructed with, it’s not hard to see why Barbour’s jackets truly become a product that you can enjoy for a lifetime, and pass on to others to enjoy after you. Having owned two Barbour jackets now, a Classic Bedale and currently the slimmer Ashby, I can vouch for how fantastic Barbour’s jackets are. They are very well made, from fantastic materials, and show true attention to detail. Barbour’s jackets are unique in that they look just as good dressed up with tailored clothing underneath, as well as dressed down on the weekend or for work outdoors. Barbour jackets are generally a true three-season jacket, and I see myself getting a lot of use out mine over my life. Many of the jackets are compatible with zip in liners that can provide additional insulation during colder weather. Another benefit of Barbour’s waxed jackets is that they tend to become more attractive the longer you wear them. They develop a certain patina with use, not unlike a high quality pair of shoes, or broken in pair of raw denim. Hats are making a major comeback in the fashion world. Arguably, a hat is the most powerful accouterment in a man’s arsenal, and depending on how it is worn, it can either make a convincing or a regrettable impression. You don’t want anything to do with the latter, so learn the rules of wearing a hat and wear it the gentleman way. Whether you’ve just purchased your hat, or you’ve been wearing it for ages, there are some essential rules and tips on wearing a hat that you probably don’t know. In this article, you’ll learn how to wear a hat correctly and the etiquette of wearing it. Read on. A gentleman should take off his hat when indoors—it’s acceptable. However, if you are in a pub, you can get away with it—no one will bother whether you’ve removed your hat or not. Outdoors is where the problem comes in. Under what circumstances should a man remove his hat? Well, it is generally accepted that a gentleman should remove his hat when he’s being introduced or when he’s saying goodbye to a woman. It’s surprising, however, that some gentlemen don’t do this. If our forefathers adhered to this, who are you not to? As a gentleman, you need to know the situations which you are required to take off your hat! Tipping of hats is an etiquette you cannot afford not to have as a gentleman. You must have noticed that some men tip their hats. Well, tipping of hats has been and is still an important way of expressing gratitude or acknowledging something. And although it is only done to ladies, it is considered very polite. When you are required to give a profound apology, just tip your hat. Similarly, when a lady thanks you, tip your hat. This is more of a necessity than a rule. As a gentleman, you need to wear your hat with a lot of confidence—it’s the only way you’ll be able to pull it off and look good. If you need inspiration on this, consider watching the white and black films of the 50’s. Many hats look good when tilted at a particular angle. Sun hats look best when tilted towards the back of the head while fedoras look best when tilted towards the eyes. A beret, on the other hand, looks best when angled towards the side. If you feel that a hat does not look right, angle it in one direction or another. Try to personalize it. Most hats look best with hair styled around the face or those drawn back. If you are to avoid �hat head’, then opt for sleek designs. 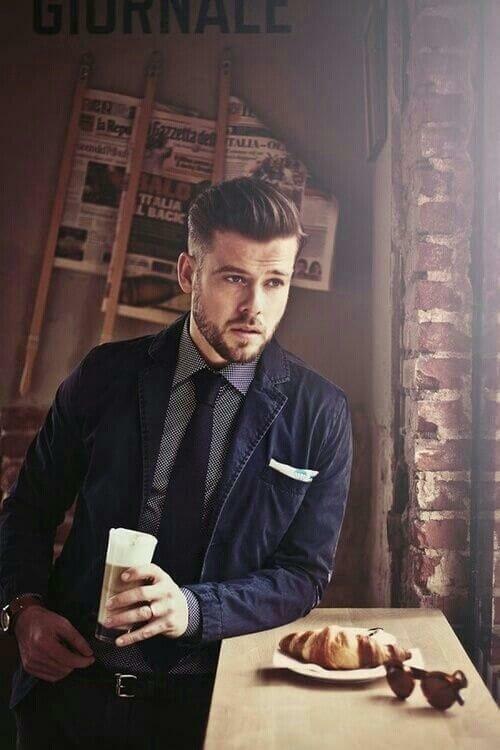 As a gentleman, you are in charge of your hair, and no one should force you to choose a particular hairstyle. However, consider changing your hairstyle when you decide to wear a hat—it’s for your own good. You want to wear your hat like a gentleman, right? Be cautious of the type of hat that you wear. Does it go well with your outfit? Common sense will always guide you to choose the perfect hat for the right outfit; therefore, if your common sense tells you that a particular hat does not go with your outfit, the chances are that it doesn’t! You can’t, for instance, put on a wool suit and wear a straw garden hat. That will be odd! If you are like most men, then you hate looking odd. Honestly, how will you feel when people refer you as an odd-looking fellow just because of a hat? Of course, it hurts, and you may even be tempted to throw the hat away. But you don’t have to; just match your hat with the current season. For instance, if it’s winter, wear a hat meant for the winter. If you have a sun hat, put it way until the winter is over. Doesn’t be a walking fashion disaster; protect your personal image by wearing the right hat at the right time. So, you want to take your girlfriend out to watch movies. Great! But what kind of a hat are you going to wear? Men, this is just a piece of advice, don’t wear tall hats to the movies. Similarly, if you have an indoor event, don’t wear a sun hat. There are many types of hats that you can choose to wear. 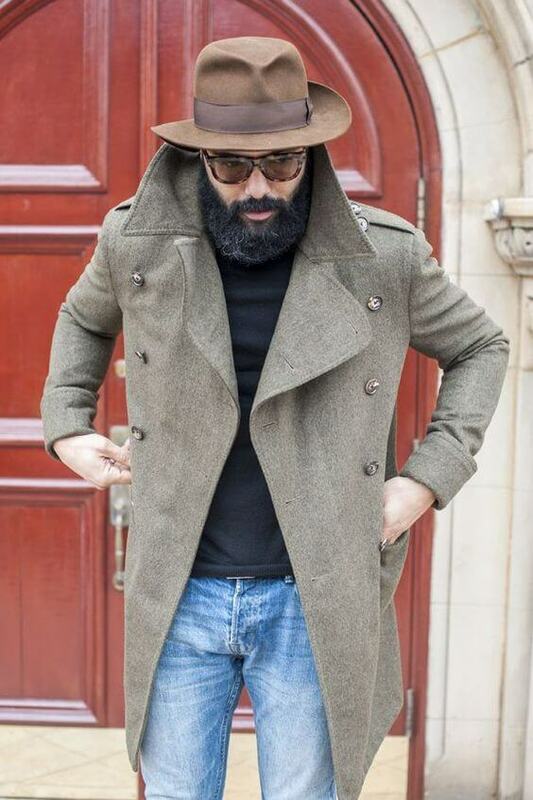 The above tips will not only guide you on how to wear a hat correctly but also help you to know the rules of wearing a hat. If a hat is not for you, well then you could always try one of these new and trendy snapback caps. When it comes to being a gentleman, the hat you wear should symbolize this distinction. Not every hat is considered elegant, so you should know which styles to invest in for your wardrobe and which ones to avoid. This hat can be worn with your everyday outfits. They have a short brim that curves upwards subtly in the back and downward in the front to keep the eyes shielded from sunlight. For more formal occasions, the fedora is a nice go-to. It has a wide brim and its raised height gives off a slightly dominating appearance. The bowler is part of a more traditional era of gentleman’s hats; the style was designed in 1849. It is hard with a very short brim that is rolled and features a grosgrain band. This hat is worn strictly as a formal hat and works best in the evening. The brim curves upwards all around and it also has a grosgrain band, though it is thicker than the band on bowler hats. This hat is one of the more casual traditional hats for gentlemen. They are usually made of tweed, a firm yet soft fabric, and the style is versatile, so it can be worn informally in most practical situations. 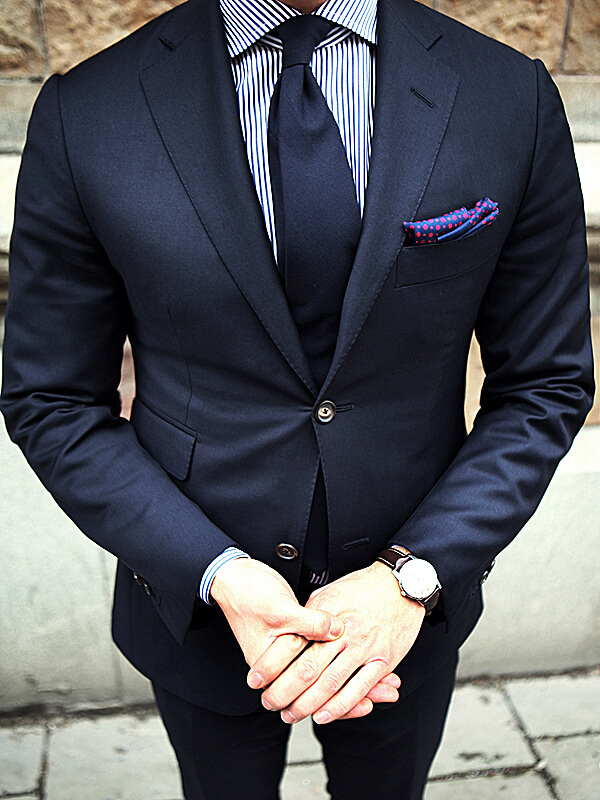 For the modern gentleman, suiting up isn’t merely a matter of selecting a set of clothes to wear for the day. Clothes express so much more; they reveal a hint of one’s personality and tell the world who he is that day (or perhaps who he would like to be). If it’s true that clothes make the man, then it’s also true that the small details can make or break that carefully put-together image. That’s why a savvy dresser pays careful attention to the small details of his ensemble, from tie to cufflinks, and chooses them so as to perfectly complete his sartorial statement. Cufflinks are a popular alternative to traditional buttons that are sewn onto many shirt cuffs. 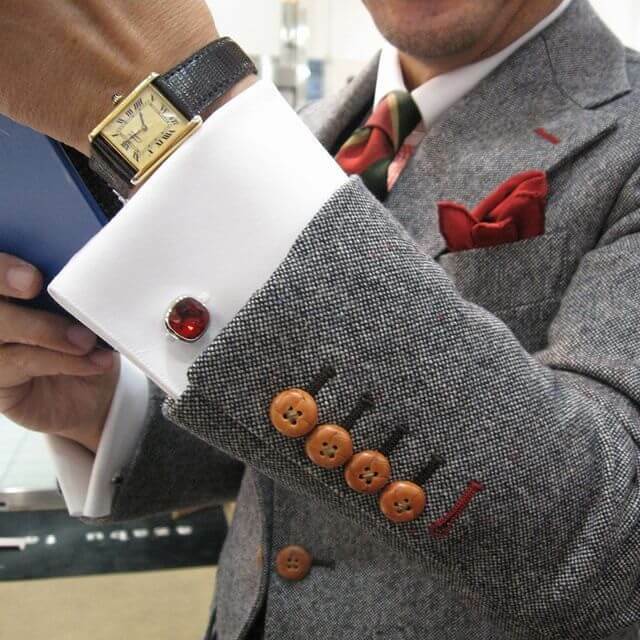 The main difference is that cufflinks are removeable while buttons are not. However, just like buttons, cufflinks can be designed in various sizes, styles, colors, and the materials used can vary. They can be considered formal or informal, depending on how they are worn. Cufflinks call more attention than buttons because they are often considered accessories, though every gentleman knows they are much more than that. They can be used to add style to an outfit or bridge the gap between casual and formal. With a nice pair of cufflinks on your wrist, your outfit will come together nicely. You can even consider matching the cufflink with another ornamental piece of jewelry, such as an earring or necklace. Many men have overlooked this accessory over the years, assuming they are merely decorative with no actual function. However, for shirts without buttons on the wrist cuff they are essential to pull together your look. You can use a fine pair of cufflinks to take your look to the next level, transforming a plain black shirt into something to be admired. Perhaps once upon a time–say, when you were still making the rounds as an intern–a neatly buttoned shirt and tie sufficed for most occasions. Now, however, that look is no longer sufficient; you’re rising up through the ranks of your company, or at the very least have the desire to go far. We’ve all heard the saying “Dress for the job you want, not the job you have”, and that means you can no longer get away with the same uniform you employed at the start of your career; it’s time to start considering the subtle details of your daily dress and the message they convey to those around you. Cufflinks seems like a small detail, but they convey a sense of finality and give the impression that the man wearing them doesn’t merely dress in the morning–he dresses to impress, because he knows he has places to go and people to see. As it turns out, there’s a psychological component to these small details. Studies have shown that even though the differences may be subtle, people generally perceive the wearer as more competent (and thus better at their jobs) when they dress more sharply. So if you want to signal your intent to rise to a management position, a pair of cufflinks is a great start to turning average workwear into something more. You have a lot of options available when shopping for cufflinks. For a truly luxe touch, look for luxury gemstone cufflinks. 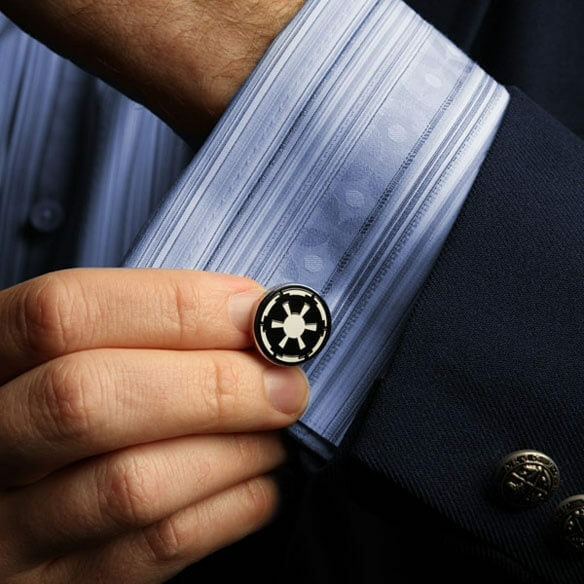 Available for example from the Elite & Luck website, these cufflinks are perfect for weddings, important work-related social events, or any black tie occasion. They add a touch of understated luxury to any suit, even if you’re not draped in bespoke. Metal cufflinks are a popular every day option, and come in more styles than you might imagine, from simple studs to intricately engraved pairs. Choose accordingly depending on the occasion and your suit; a simple pair might be better suited to a suit with more texture, color or pattern, while a more elaborate pair of cufflinks is perfect for adding visual interest to a basic suit. If you have a whimsical side and the opportunity to express it–say, on the weekends, or at a job where creativity is highly valued–then there are many different unique varieties of cufflinks to scratch that sartorial itch. For example, later this year Deakin & Francis is launching a new collection of cufflinks to celebrate their 228-year heritage; among the pieces up for offer in the 1786 Collection are cufflinks stamped with a skull and crossbones. (It’s a nod to an ancestor of the family, Arthur Daykin, a naval officer who battled pirates in the 16th century.) 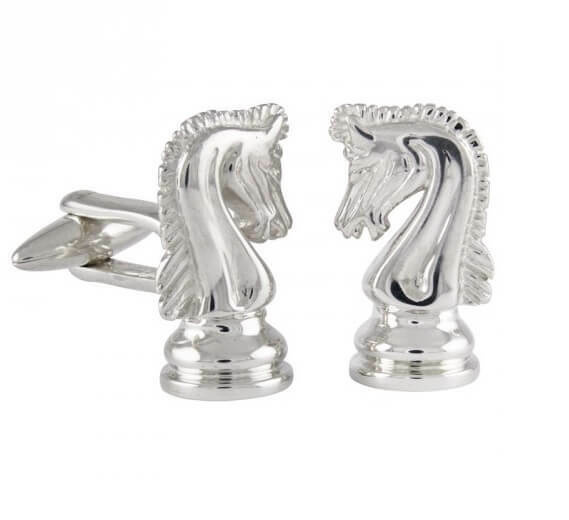 Or consider the silver chess-inspired cufflinks below from Zaunick. We all know that one gentleman who seemingly has everything money could buy and who presents a dilemma every time a gift-giving occasion arises. Chances are, however, that he would be delighted with a new set of cufflinks. Ties can quickly fall into the realm of endless repetition, but like jewelry, cufflinks offer you endless options for new styles to suit various tastes and occasions. Even if the gentleman receiving the gift already owns an extensive collection of cufflinks, it probably won’t be hard to find a new pair to add to his collection. Cufflinks also make an excellent gift for any younger gentleman in your life who is just graduating or entering the professional workforce for the first time. A pair of cufflinks is not only a very “adult” gift–a way of saying, “Congratulations, you are no longer a child, but a man”–it’s a very practical one at that. This is a particularly excellent gift to commemorate a serious occasion, like acceptance into his university of choice or a major promotion at his workplace. The young man will now have a pair of cufflinks for any weddings, job interviews or professional events that he may have to attend, ensuring he will stand out from a crowd of peers as a young man who takes himself (and his image) very seriously. Dandy fashion has existed for several centuries, so it can’t rightly be called a new trend in men’s fashion. However, modern gentlemen are returning to many of the elements of dandy fashion that largely fell by the wayside over the past decade or so. The modern man isn’t content to merely get dressed each morning; he embraces fashion as a form of self-expression and even as an extension of self. He understands the importance of quality in clothing and appreciates the small details—clever stitching, perfectly coordinated colors, or that one standout accessory that elevates an outfit to an art form. At one time, dandyism was comprised heavily of excessive styles: lots of velvet, lace, jewelry, and even wigs, as seen on the fashionable young Parisians and Londoners who helped launch dandy fashion. Over the years, however, dandy fashion has come to be associated less with over-the-top dressing, and is now typically used to mean any man who appreciates fashion and enjoys expressing himself through his sartorial choices. Some dandies dress to stand out from the crowd, while others opt for a more understated sort of elegance with muted colors and minimal ornamentation. Some dandy gentlemen are heavily influences by historical dandy fashion, as seen in novels like The Picture of Dorian Grey or The Great Gatsby. 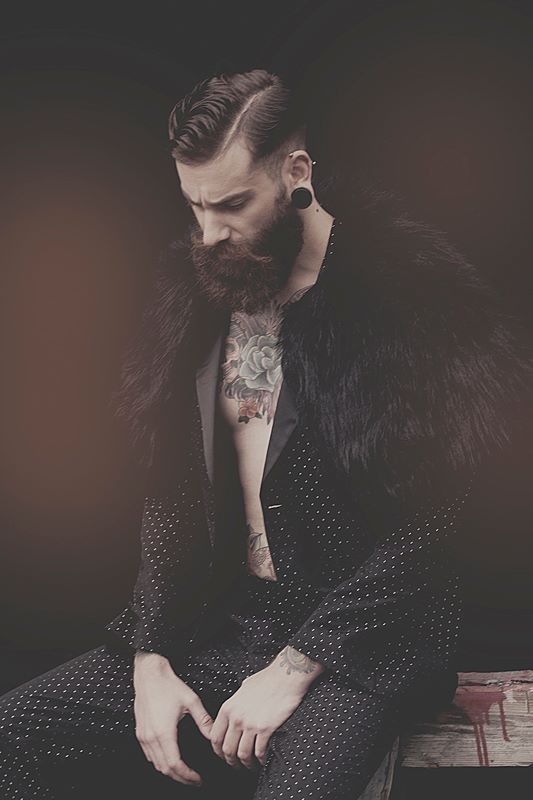 However, some dapper gentlemen embrace a modern spin on the style, and you may spy a dandy dresser sporting an impressive (but well-groomed) beard, gauged earrings, or a tasteful and meaningful tattoo. This fusion of rebellion into classic style is yet another way the modern man may choose to stand out from the crowd, style-wise. The hallmark of dandy fashion is impeccable tailoring. While the overall style encompasses a range of garments suitable for a variety of occasions, they are all well-cut and show remarkable attention to detail. If it looks good and fits well, then it’s acceptable; anything with poor tailoring or slipshod finishing is out. Tailoring is so vital to a dandy because his clothes are an expression of his self; how he wears these garments conveys to the world that he takes pride in his appearance and, by extension, his own person. He has confidence and accordingly his garments should be spot-on to match. Bear in mind that the dandy man does not overdress. His flair for the fashionable doesn’t lead him to over-accessorize, nor does he feel the need to pursue fashion trends simply to stay “in style”. Some dandy gentlemen opt for a style that may appear flamboyant to the untrained eye, but it is really the careful cultivation of textures, colors and other details. Don’t be afraid of the careful mixing of textures, colors and patterns; the overall effect can be quite artful when done carefully. Generally speaking, the dandy gentleman does not “dress down”. He would certainly not be caught in public in sweatpants, and it’s unlikely he spends much time in casual clothing. Whether he’s attending a black tie event or spending a leisurely Sunday brunching with friends, his outfit will be carefully coordinated yet calculated to look as though it takes him no effort at all to appear so pulled together. When this gentleman does reach for denim, it will be a carefully tailored pair with a crisp button-down, belt, blazer, and his most stylish shoes. 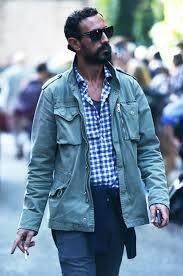 Most of the time, though, he will probably eschew denim for a more refined fabric like linen or corduroy. 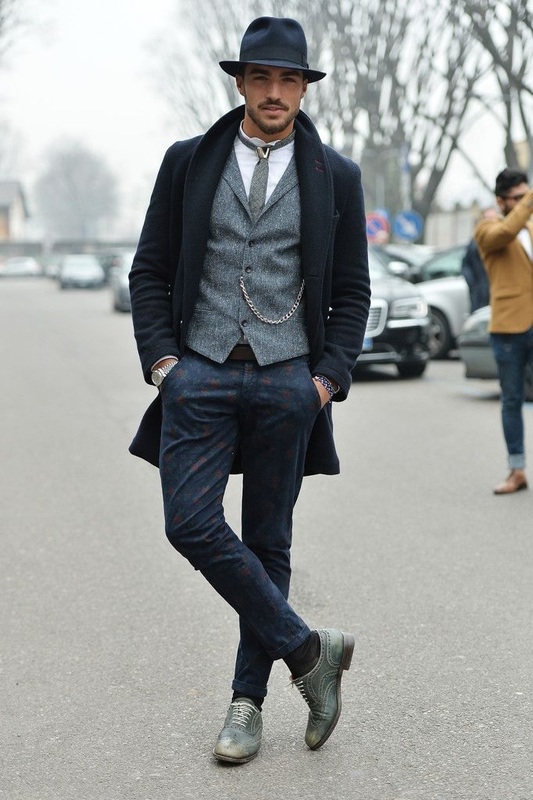 Classic elements of dandy style include items like a trench coat, cuff-links, blazers, scarves, and well-tailor pants. Depending on the occasion, you may also find elegant hats, gloves, vests, wing-tip shoes, or even a leather jacket. Fabrics like silk, linen and tweed are in heavy rotation. To complete your dandy look, confidence is the most noticeable detail in fashion. A gentleman should look comfortable and confident in his specially coordinated outfit. 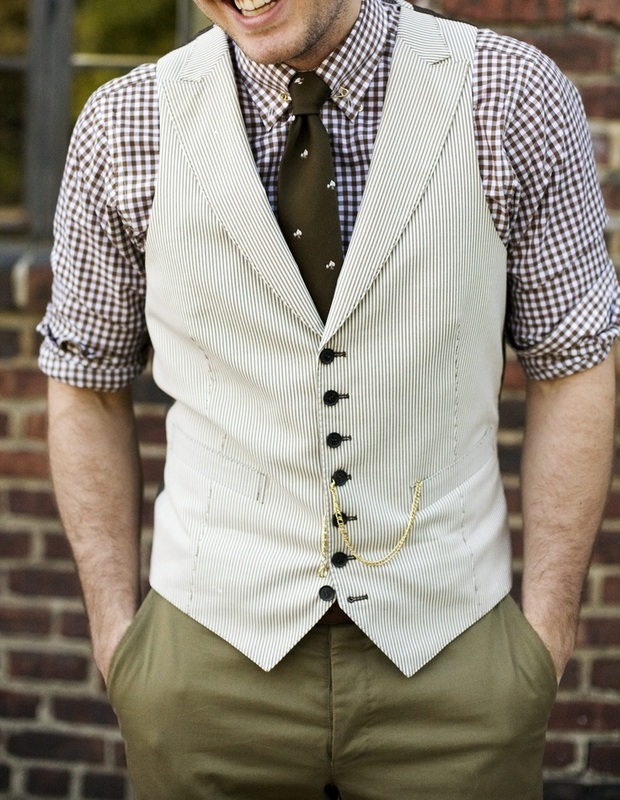 You may love a suit or accessory, but you must also appreciate how it complements your overall features. As a form of self-expression, the classic gentleman wears his clothes with pride and makes sure every detail has been curated to give the desired effect. If you enjoy having all eyes on you, then go for a dandy look with bold colors and patterns. However, be sure not to pair too many bold patterns together as this could detract from the overall look. A gentleman avoids the faux pas of dressing over-the-top while making pairings and mixing accessories. If you prefer a more subtle approach, then darker colors or muted tones with a few stand-out accessories (a bright pocket handkerchief or sharp cufflinks) would work best to customize a dandy look. No matter which approach you choose, a loud or subtle dandy look or something in between, remember that a gentleman must be secure in his own skin and attire. When you are self-assured, your wardrobe speaks for itself. 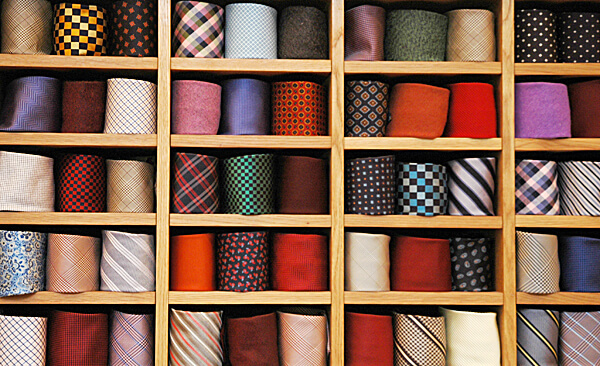 A dandy gentleman need not fill his wardrobe with bespoke suits to look dapper. If you’re building a dandy wardrobe on a budget, consider a high-low mix of pieces from brands like Brooks Brothers, J. Crew, Tommy Hilfiger, Cole Haan and Banana Republic. 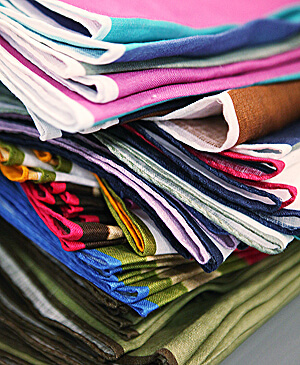 Also, invest in a quality tailor; even off-the-rack clothing can be made to look and fit like custom apparel with a few tweaks from a talented tailor. A tailor can also add those little details, like custom top-stitching or buttons, that subtly enhance the appearance of an otherwise plain piece of clothing. Accessories are an excellent way for a gentleman to expand his wardrobe at a low cost. Cashmere scarves are cheaper than sweaters and can be mixed with a variety of other pieces to create multiple outfits. (Dandy travel tip: they also maximize your wardrobe without taking up too much room in your suitcase!) A new waistcoat in an eye-catching color, pattern or fabric will cost much less than a new blazer, so stick to a few blazers in neutral colors and textures and enhance them with a variety of vests underneath. A blazer in black or navy wool is an excellent choice for winter, while cream or grey linen or summer wool is perfect for warmer months. One mistake that a gentleman of style should never make is skimping on quality in order to acquire a larger wardrobe more quickly. Cheap fabrics look and feel, well, quite cheap. Buttons that are not stitched on securely will quickly go missing; poorly finished seams are apparent to the naked eye and can spell disaster after a few washes. It’s better to limit your sartorial choices and wear only quality pieces, then add in a few new items at a time as your budget permits. Dandyism is about more than your clothing; the dandy gentleman also pays careful attention to his grooming and is immaculate in appearance. A dandy gentleman would never be caught with unkempt hair or an untrimmed beard; he will maintain his hair cut, color and style as well as any facial hair. The dandy man also invests in quality grooming products such as signature cologne, a good quality cream to keep his hands in tip-top shape, and facial serums or eye creams to preserve a fresh, youthful complexion. For a dandy, there is no such thing as being too invested in personal hygiene. Some dandy gentlemen will wear cosmetics to enhance their features. A department store makeup counter can help you color-match lightweight foundations and concealers for redness or dark undereye circles. If you’re new to the concept of dandy fashion and want to learn more, pick up the book Artist/Rebel/Dandy: Men of Fashion, by Kate Irvin and Laurie Anne Brewer. Irvin and Brewer are the curators of the exhibit at the Rhode Island School of Design Museum that inspired the book; through art and essays they explore the history, culture and ever-changing trends buried within dandy fashion. Spring is in its full bloom and summer is just around the corner, so this is the perfect time to talk about very popular footwear, especially here in Europe. The driving shoes. Admit it or not, but driving shoes are the perfect summer footwear. Not only they look beautiful they are really versatile, but before we talk about style let’s go back in time and see where do they come from. A driving shoe is a type of moccasin constructed using rubber at the back of them. They also have rubber grips on the soles and heel of the shoe to give gentleman more flexibility. Driving shoes, in short, have been designed to make movement flow easily between the pedals of a car. You can also refer to these shoes as “driving loafers” or even just as “drivers”. They slip onto the feet with ease, with no laces to take away time from driving. If you want to make driving shoes a part of your look, there are a few styles you can work with to effectively pull them off. This is a shoe that is very neat with quite a delicate appearance, so it should be paired with a tailored outfit that is more on the casual side. 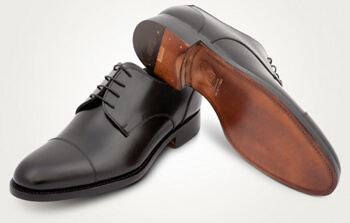 Driving shoes were traditionally made to go with a specific look, and that has not changed much over the decades. Driving shoes can add a bit of charm and neat informality to your outfit as long as they are worn well. Back in 1963 Italian company Car Shoe was founded and they patented this innovative shoe. At first it was a shoe for the rich, because not everyone could afford leather shoes just for driving. Driving shoes purpose was to replace traditional shoes while driving. Since wealthy gentlemen did not want to wear the soles of their shoes and sometimes normal shoes can be cumbersome for driving. Anyone with larger feet will agree with this. Myself included. I wear 46 (US 11.5) and if I wear some boots or brogues I don’t feel too comfortable driving. Either my shoes are too big for pedals or the soles are too thick so there is not enough sensitivity in the foot for driving. Driving shoes are ideal for this purpose. The Cars Shoe brand soon became known for its signature moccasin with rubber pebbles. 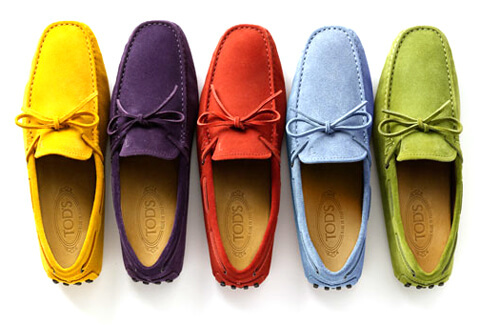 Since we mentioned, driving shoes appeared to be luxury item not many could afford, but Diego Della Valle, owner of another famous Italian brand, Tod’s saw an opportunity to sell soft, comfortable shoes to the masses. Instantly these shoes were a huge success. From that point on, driving shoes have become fashionable item available to everyone. Even if you do not own or drive a car you can wear them because they are ideal shoes for hot weather. Another beauty of the driving shoes is that they come in almost any color imaginable. Of course there are expensive models, and there are affordable ones, so there is nothing stopping you from owning several items. Since they come in so many colors you can pair them with almost anything. You can wear them in casual occasion or in more formal ones. For casual styling you can pair them with a shirt and pants. Chino pants, white pants, jeans, even suit pants. You can show some of your ankles by folding your pants a bit. Of course they go great with short pants. For more formal occasions you can wear them with your linen or cotton summer suit. They will look great. If you want to be a bit more noticeable by showing your sprezzatura style you can buy them in some really bold colors. I for example have one in purple and they really look great. Turquoise color is also great option for driving shoes. It is bold color and it is the perfect summer color. For more formal occasions you can wear black or brown ones but I prefer them in brighter colors. Beige color is also popular and it looks great on white shirt and light gray trousers. One thing is a must with driving shoes and that is not to show your socks. Some will say that you should not wear socks at all with driving shoes, but I don’t like to be barefoot in any kind of shoes. If you are OK with it, then by all means wear them barefoot because that is the proper way to wear driving shoes, but as I mentioned I always wear socks with any kind of shoes. For this purpose you should wear no show ankle socks which are cut even deeper than ankle socks. No show ankle socks are cut so deep that they cover only the top of your toes and just the bottom back of your heel. In this way your feet will stay protected from the leather and sweating and the driving shoes will stay protected from the sweat. Not to mention that the shoes will be free from unpleasant sweat odor. There are two versions of driving shoes. Smooth supple leather and velvet looking suede ones. I myself prefer suede ones. They just look better in my opinion and they feel less casual than the supple leather ones, and casual feel and look is the main purpose of the driving shoes, except great feeling they provide while driving, of course. Styling wise there are models with tassels, with faux shoe laces and penny loafer looking ones. I prefer penny loafer ones. Tassels are a bit too much for me, but it is just a matter of preference and style. Both are looking great. Because driving shoes are made of one layer of leather they feel really soft but if they are not made of the best leather, read expensive, they are not long lasting. Although you can find cheaper ones that will last a few seasons at least. 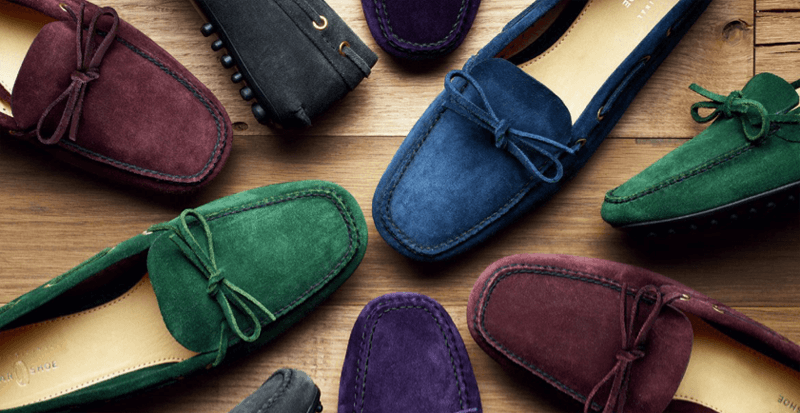 Top brands to consider are the two above mentioned manufacturers but almost every shoe and clothing brands have loafers in their portfolio so I am sure you will be able to find the ones that suit your budget. I can recommend Leffot brand but their price is a bit higher, around $300US. If this is too much, you can find great driving shoes for less than $120US. In this price range I can recommend French Bobbies. Mass market brands like H&N, Zara or Massimo Dutti have them for less than a $100US so you can buy few pairs. If you buy these cheaper ones do not expect them to last but driving shoes are not something you will take care about that much so it is OK to change them every few seasons. In my opinion they are like sneakers. Tear and wear them, buy few different colored ones and just enjoy them as long as they last. 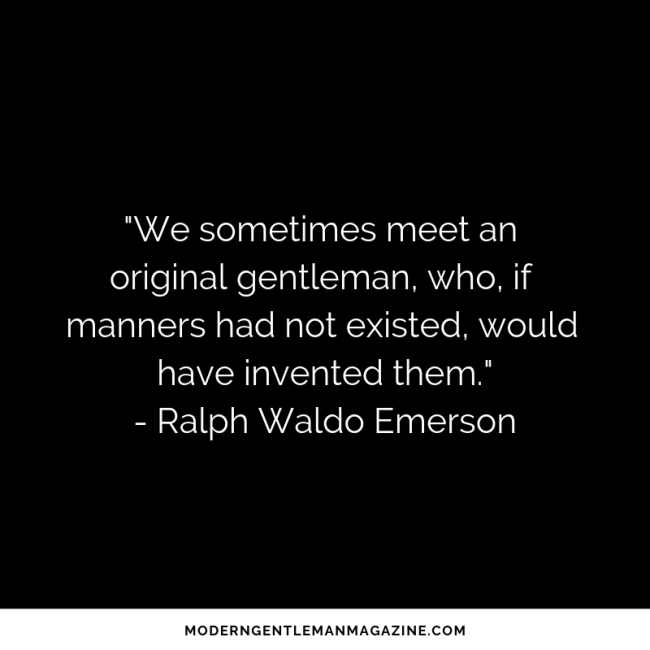 Sometime over the past few decades, the pursuit of being a true “gentleman” fell from the forefront of the typical man’s life. 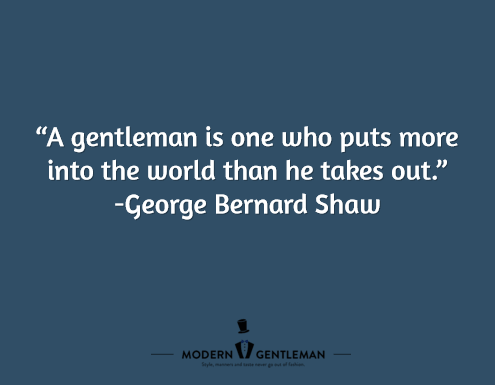 Thankfully, over recent years, man’s pursuit of what it truly means to be a gentlemen has regained momentum. This has been evidenced partly by the interest shown in sites like The Art of Manliness, Gentleman’s Gazette, and yours truly. Although much has changed over the years, there is always wisdom to be found in looking back to gentlemen (and women) of the past. 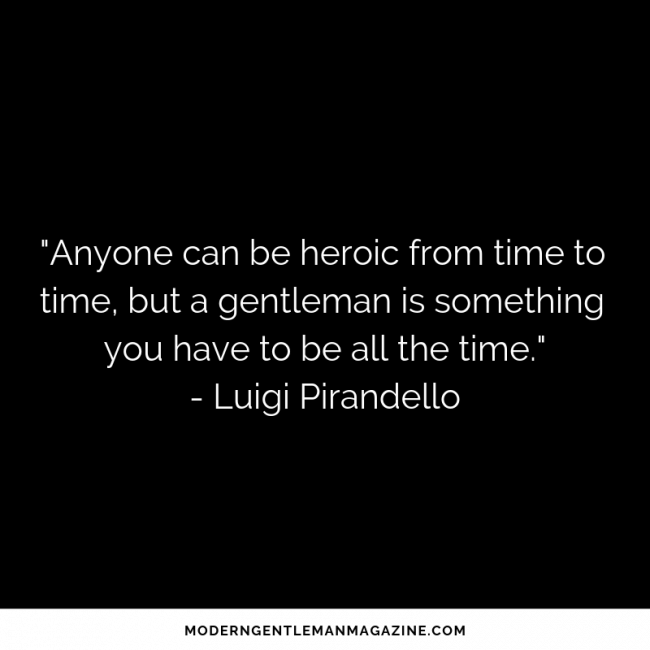 In this article we will present some quotes on gentlemanly living, and how they apply to our lives today. Many of the gentleman quotes and sayings I came across when researching this article spoke for themselves, this one included. “Money can’t buy everything” is an old adage, and integrity is certainly not a trait that can be purchased. Integrity is something that you develop everyday and through every decision you make, especially in the moments where no one is watching. Will you stay true to your beliefs when there is no one there to catch you otherwise? I encougage you to discover the deep satisfaction that comes with making the important daily decisions that lead to a life of integrity. Anyone, regardless of wealth or social stature, can positively affect those around them. Even when you are down or don’t have two coins to rub together, I encourage you to try and make the life of someone around you better today. In doing so, you will make the lives of others richer. After all, being rich is only partly about the amount of money in your bank account. It’s easy to show respect to someone who can directly benefit you. In fact, it takes no personal effort at all when you anticipate receiving something of value in return. If you are honest, you are really doing something for yourself. It takes much more effort, however, to serve or show respect for someone that can do nothing physically, for you in return. Again, I encourage you to make serving these types of folks part of your everyday life. You will find a deep sense of gratitude for what you do have, and the satisfaction that accompanies looking beyond yourself and your own interests. I enjoyed this piece of wisdom, mainly because it encourages us all to continue our education and self improvement throughout our life. Book learning is certainly valuable. By frequenting sites like this, you are already exhibiting a desire to learn. I encourage you to take it a step further, however. 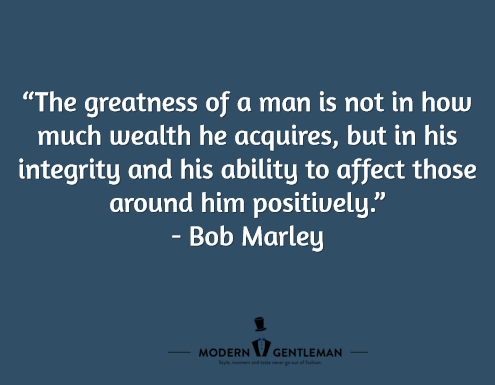 Continuing to strive to be gentlemanly through interacting with others, and reflecting often on your rights and wrongs will keep you growing and effective. 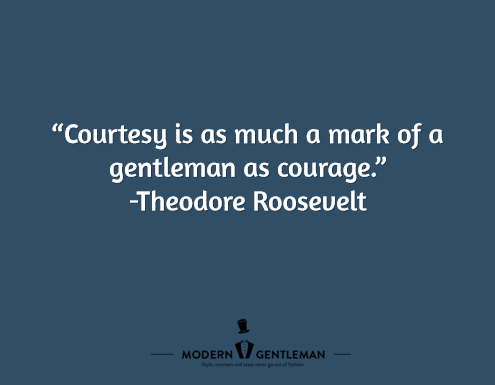 Common courtesy for others is a true mark of the modern gentleman. Courage is always important, but each day we have many more opportunities to show others common courtesy. It’s easy for us to think and make decisions with our own best interests in mind. I encourage you to start thinking about how your decisions and actions impact others as well. Society as a whole will benefit. What a wonderful thought. All gentlemen must be constantly aware of the fact that our time is finite… to live with the end in mind. When I come to the end of my time, I truly hope that I have added more to this world than I took of it from others! This is one statement that I will personally reflect on in the coming weeks, for sure. And with this statement, we circle back to integrity. Do your thoughts, words, and actions all match up? Are you the same when the “lights and cameras are rolling” as when you are on your own in private? 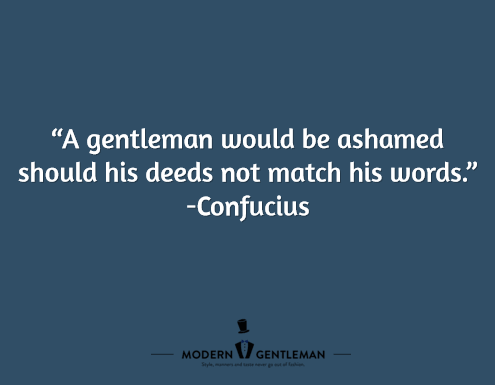 Integrity is key in the modern gentleman’s life. We all make mistakes, but I encourage you to “dust yourself off” when you do stumble, and get back on the road of integrity. You are the sum of the individual choices you make everyday. Make choices that increase your integrity! And remember, yesterday is in the past. Everyday we have the chance to learn from the past, but to chart a new course moving forward. That is one of the true gifts of this life. I hope you found some inspiration in the words above from our past. 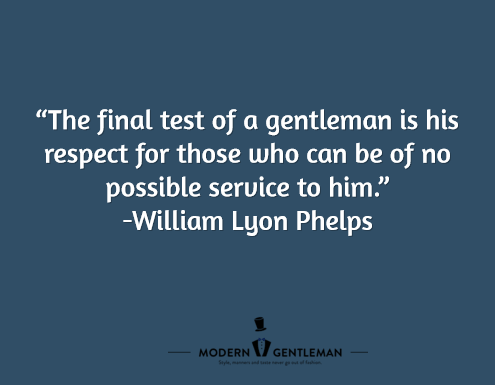 The pursuit of being a gentleman is a lifelong journey, but is one that is absolutely worth the effort. 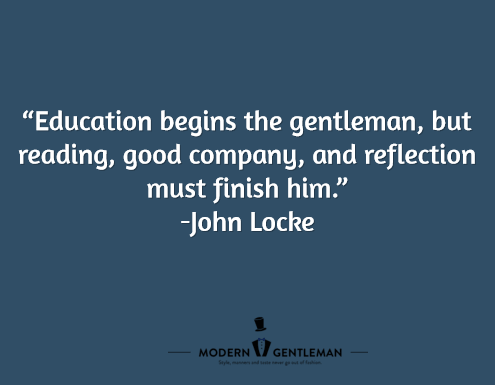 We encourage you to reflect daily on what it means to be a gentleman in today’s society, to always keep a hunger to learn and grow, and that you find the courage to put things into practice. If, one by one, men all around the world made gentlemanly living a pursuit, the world would truly become a better place for all. As I researched quotes on gentlemen for this article, I was amazed by the vast amount of wisdom available online. I encourage you to do your own search, and plan to include more in a future article. As always, if you have thoughts or additional nuggets of wisdom, please share them in the comments below.